On Friday, day three of our Hawaiian adventure, we drove north from Waikoloa on Hawai’i Island’s west coast to the base of the Kohala Mountains. Turning east, we climbed 2500 feet up and across the mountain ridges into a lush landscape, especially compared to the black volcanic fields near Waikoloa. As we drove towards the east coast we had beautiful views of the Pacific Ocean, with many inlets bringing water into gullies of giant ferns and waterfalls. At the coast we turned south towards Hilo, Hawai’i Island’s major centre of business and government. We didn’t stop for photos because it was misty and rainy up in the mountains and we needed to concentrate on staying on the correct side of the road (opposite to Australia, so surprisingly effortful) and navigating. 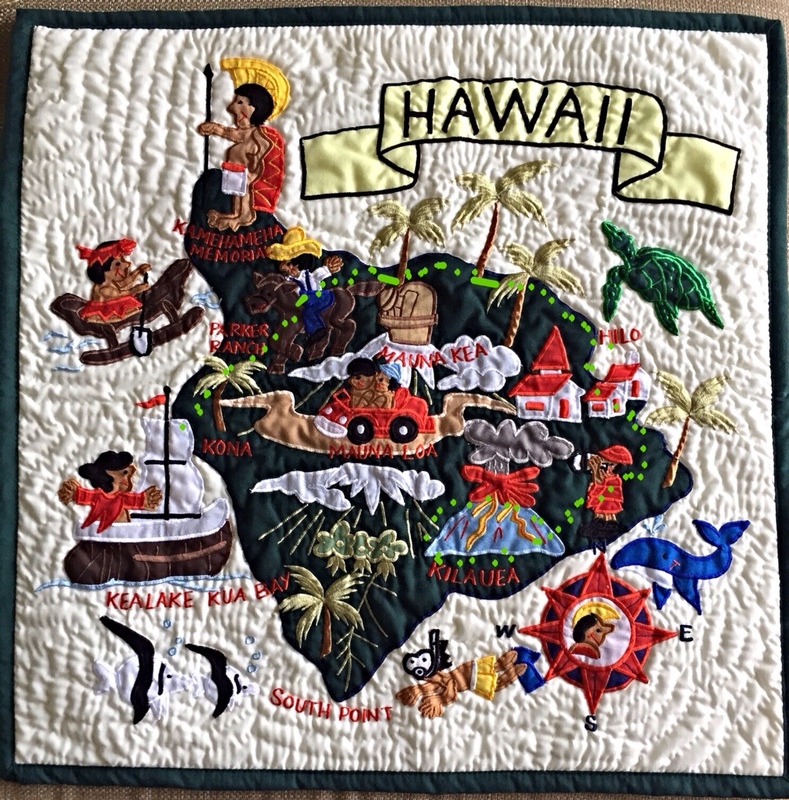 From Hilo we turned south west towards the world’s largest volcano, Mauna Loa, and the world’s most active volcano, Kīlauea, both within the Hawai’i Volcanoes National Park. Although Manua Loa is the most massive mountain on Earth, taller than Mount Everest (from ocean floor to summit it stands 17,000 metres, more than 8,000 metres taller than Mount Everest), people mostly come to see the steaming and roaring Kīlaueau Caldera and the lava flows of its East Rift Zone. Volcanoes are monuments to Earth’s origins, evidence that primordial forces are still at work. 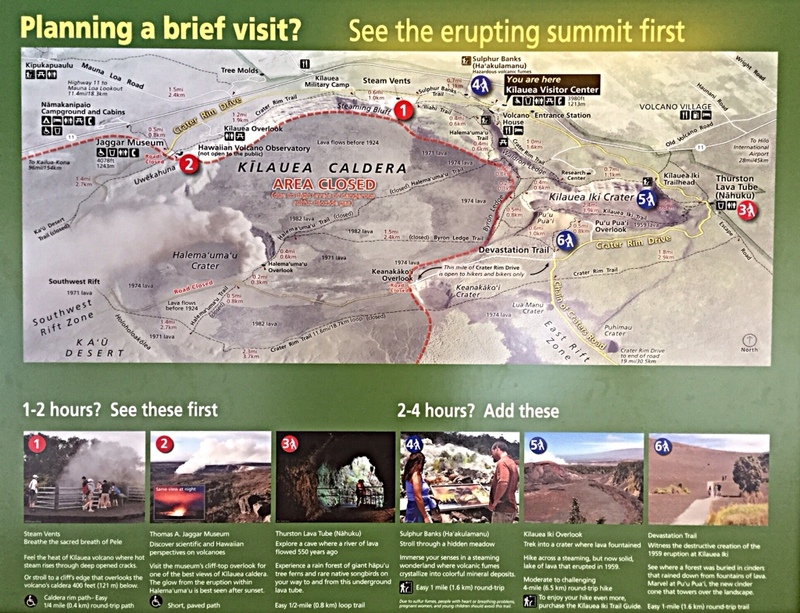 You can drive around the caldera on Crater Rim Drive (at least until a section where the road has been closed due to dangerous volcanic activity) and you can drive down through the outpourings in the East Rift Zone on Chain of Craters Drive. We arrived around 5pm after 3 hours of driving from the east coast and first stopped at the Visitor Centre. 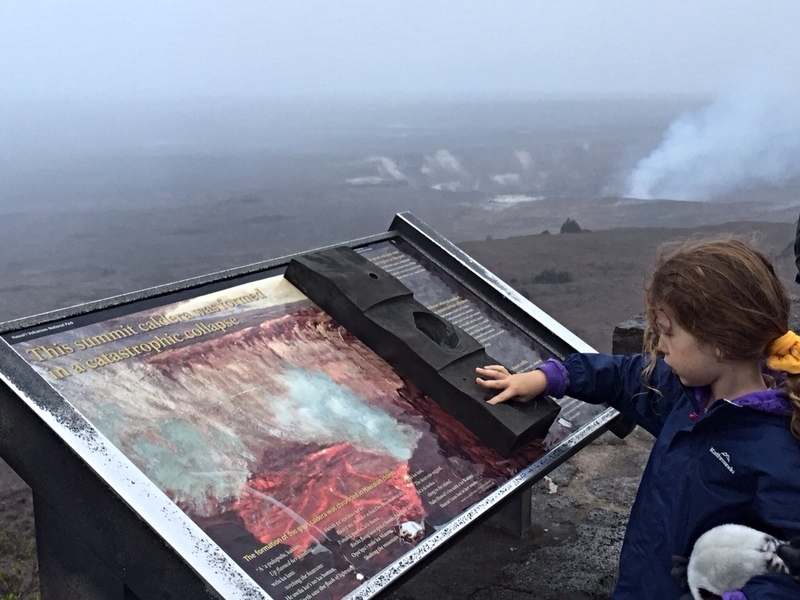 Here we found helpful suggestions for three main things to see and do over a couple of hours: (1) “breathe the sacred breath of Pele” from steam vents, (2) view Kīlauea’s erupting summit from the lookout at the Thomas Jaggar Museum, and (3) “explore a cave where a river of lava flowed 550 years ago”. 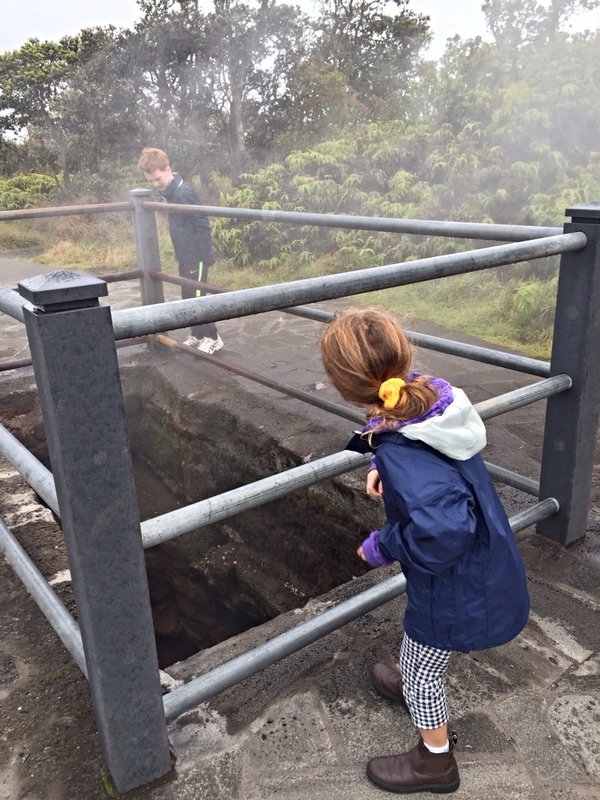 First to the lava vents! Just off Crater Rim Drive we saw plumes of steam rising from cracks that have opened in the ground, venting from the volcano far below. 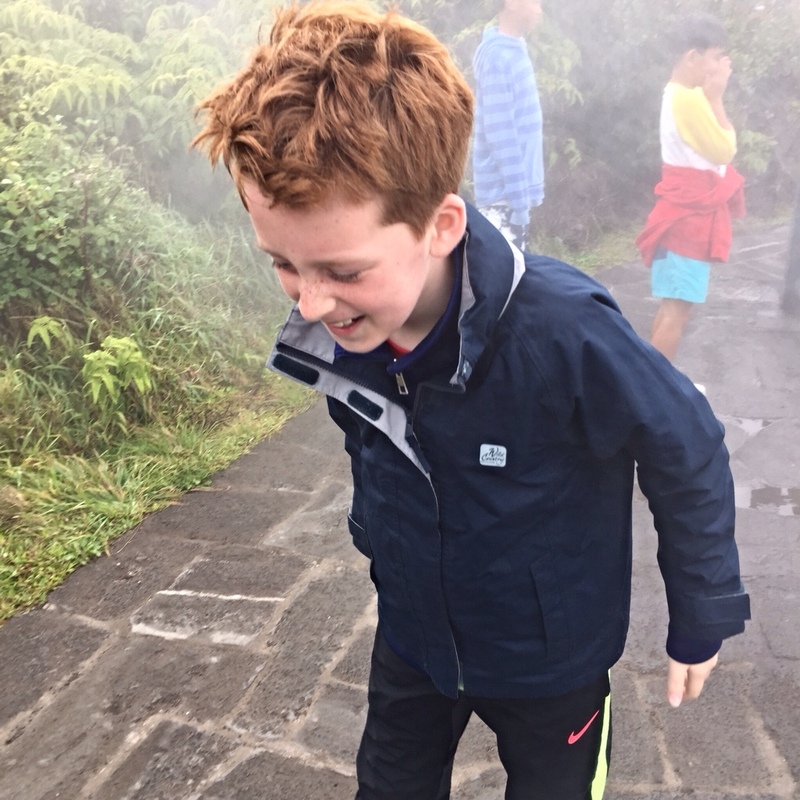 As you can see from Oliver’s red face in the photo below the steam was very hot and wet. If it was Pele’s breath, according to Louisa, she smells sweet like pancakes. Oliver and Louisa threw coins into the vents. Their pennies joined many coins and other offerings, supposedly to appease Pele and quieten her fiery rumbles. Next we drove to the Thomas Jagger Museum, which overlooks the Kīlauea Caldera. We could see a plume of volcanic gas rising from the caldera, apparently from molten rock in a lava lake on the summit (which we could not see). We also could hear rumbles from the volcano. Similar to, but deeper and louder than thunder. The Thomas Jagger Museum is excellent and well worth a long visit. It provides lots of information about the science of volcanoes and the science of studying them. Kīlauea’s current eruption started in 1983 — over 30 years ago — and has been shaping the surrounding landscape in major ways ever since (as well as long before)! 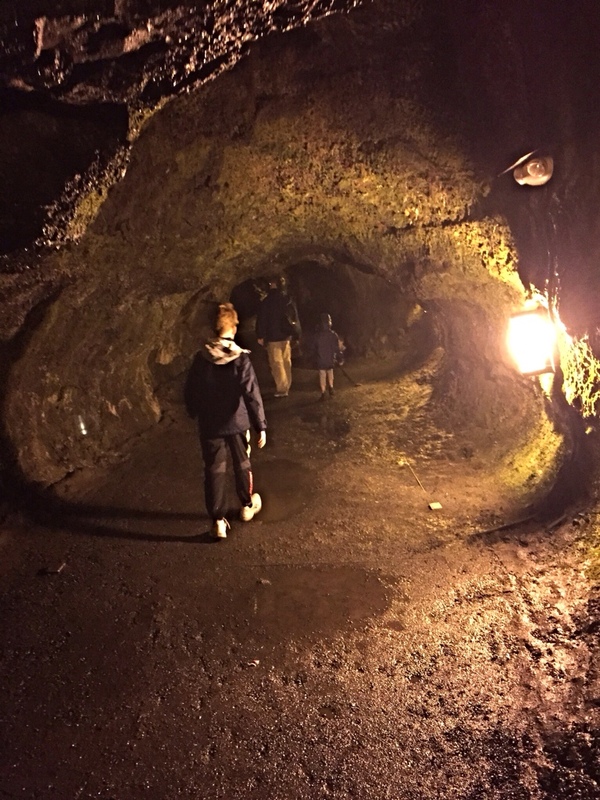 Next we visited the Thurston Lava Tube, named for Lorrin Thurston who helped Dr Thomas Jagger (more on him below) to establish the Hawai’i Volcanoes National Park and preserve this important and unique environment. To reach the Lava Tube first we hiked through rainforest around the rim of the Kīlauea Iki Crater. It was foggy over the rim so we couldn’t see the bottom clearly except to know it was a long way down. 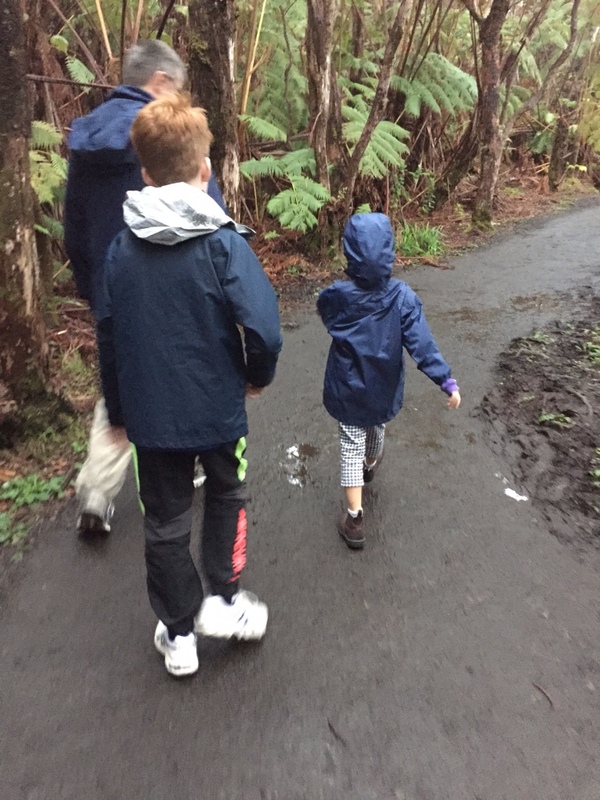 Then we walked into a valley of giant ferns until we reached the mouth of the Lava Tube. Over 500 years ago a subterranean river of lava ran through here. When it drained away it left this amazing tunnel that looks like a man made railway tunnel. But it was carved by molten rock and left as a walk in museum exhibit to the forces of nature! Finally in gathering darkness and increasing rain we returned to the lookout next to the Museum. The glow of the lava lake within the caldera lit the sky an eerie orange colour. It was an impressive sight! Perhaps the inspiration for the fires of Mordor? 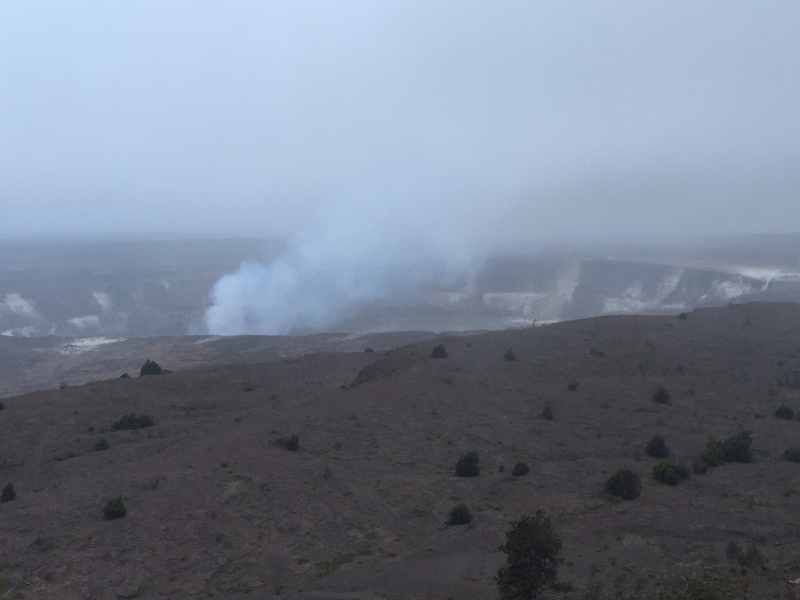 Here’s a link to a 24/7 webcam of the Kīlauea Caldera so you can see what we saw (unfortunately without the impressive rumbling). Although the drive to meet Pele and return was long and exhausting (and somewhat terrifying on the way back to our resort in the dark, on unfamiliar roads, in torrential rain and on the wrong side of the road), it was a trip worth making. The Hawai’i Volcanoes National Park looked like a place where dinosaurs and other ancient creatures might be at home. A fierce, primordial landscape. Although forbidding, Kīlauea actually is one of the most studied and best understood volcanoes on the planet. 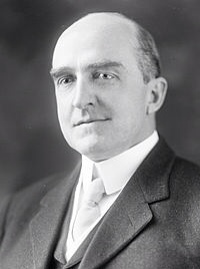 Scientists have been studying Kīlauea at least since 1921 when Dr Thomas Jaggar, a Professor of Geology at MIT in Cambridge, Massachusetts, founded the Hawaiian Volcano Observatory (on the spot we visited) and pioneered many of the techniques of volcanology. 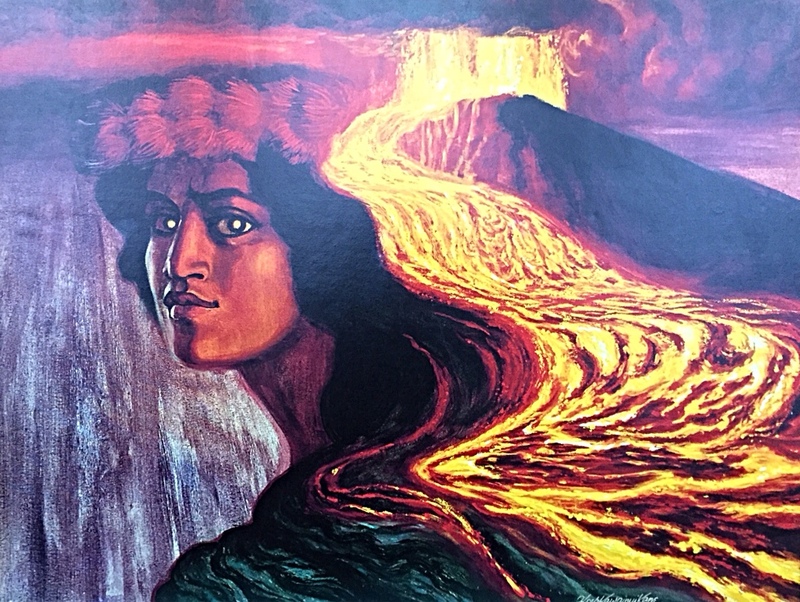 We loved exploring how these volcanoes had shaped the birth of the Hawaiian Islands as well as the birth of an entirely new science necessary to understand the secrets of Pele and her fiery ways! Our next stop: The fabled North Shore of O’ahu! 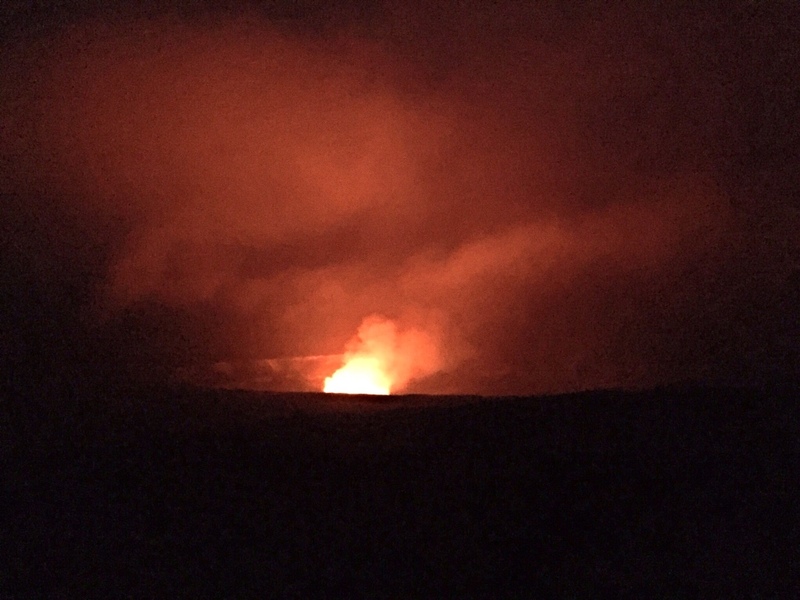 This entry was posted in Hawaii, Out and about, The Big Island, volcanoes on April 15, 2015 by Amanda Barnier.